Features: Giant... weights almost a pound of STEEL... Great Protection! Invicta BOLT 13749 SS Bracelet & Deployant Clasp! 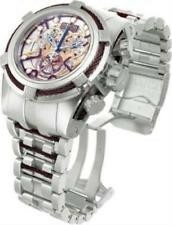 Invicta 13749 Mens Reserve BOLT ZEUS Swiss COSC Brown Accent Stainless Steel Watch 13749 Looks like the JT version. Swiss Made ETA 251.233 COSC Quartz Chronograph, Flame Fusion crystal, Screw Down functioning Pushers, deployant clasp, 52mm x 62mm with lugs, weighs 14 oz, 200 meters! Sell for $450 or Trade!